Offering many advantages, electrofusion fittings are a choice method for creating a secure network of pipe systems. With electrofusion fittings, pipes and adaptors can be joined without having to move the pipes during welding. The finished work gives secure, reliable and long-lasting joins, in a way that is efficient and easy to do. To reap the benefits of electrofusion, however, proper installation practices must be observed. This is easier said than done because welding operators often have to work in confined spaces or busy areas and in harsh weather conditions. Pipes are sometimes subjected to handling damage when on site, or during installation. A degree of cuts or scrapes are allowed, but make sure that the damage is not more than 10% of the wall thickness for water pipes and not more than 5% for gas pipes. Before scraping, wipe down the pipe’s joining area with a clean cloth or towel that does not leave fibres. Improper scraping is one of the most common causes of electrofusion failure. Scraping is primarily to reveal a surface that has not been exposed to UV rays, to allow for proper bonding. If the surface is not scraped, the surface will heat up, but may not bond with the Electrofusion Fitting. To ensure that you don’t scrape off too much of the pipe and that you are scraping the pipe evenly, a rotary scraper is ideal. 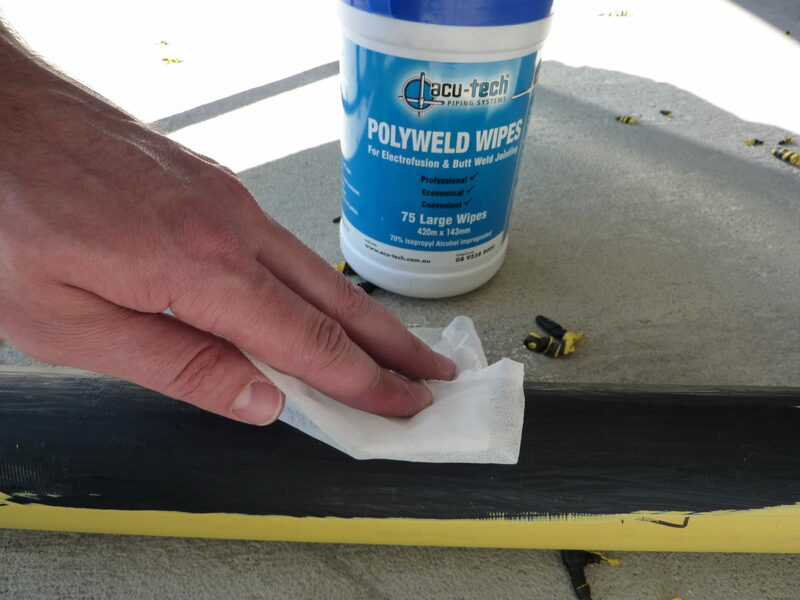 Before inserting the pipe into the electrofusion fitting, wipe down the surface with Poly Welding Wipes — an Isopropanol impregnated wipe, to remove any residue. Ensure that the surface is properly dry and that it does not come into contact with further contaminants. Refrain from touching the scraped and cleaned surface and check for small substances such as lint from the cloth, dust or oil from the skin as these affect the quality of the weld. Ensuring proper and secure alignment is one of the most important aspects of electrofusion welding. Throughout the heating and cooling phases, the pipes and fittings must be aligned with each other. Make sure you’re using right-sized clamps and that they are securely clamped on to keep everything tight and straight. Electrofusion welding machines provide welding instructions at the right time. Follow these instructions precisely to allow adequate time for heating and cooling. Remember to stand at a proper distance, at least a meter away, in case the machine malfunctions and polyethylene melts. Proper electrofusion welding may be challenging with its demand for skill, consistency and precision but with the possible consequences and costs of failure — it must be done correctly. Have Questions on Electrofusion Welding? Acu-Tech’s team is always willing to help out. We also offer an Australia-wide electrofusion welding training courses for those interested. Simply book a course with us for your team and complete our enrolment form. As a market leader in pipeline solutions, we offer years of expertise along with an extensive range of pipeline products. From civil to electrical and communications, we have piping systems for all of Australia’s sectors. Contact us today with your requirements, and we’ll take care of your piping system needs. Disclaimer: As always with information supplied by Acu-Tech Piping Systems, we supply it as a guide in the interest of better understanding of technical properties of our products. However, the application of such information may involve engineering judgements which cannot be correctly made without intimate knowledge of all the conditions pertaining to a specific installation. Acu-Tech Piping Systems does not act as a consultant in this regard; the responsibility for the use of any information or advice contained herein rests solely with the user. It should not be used in place of a professional engineer’s judgement or advice and it is not intended as installation instructions. See full disclaimer here: https://www.acu-tech.com.au/information-disclaimer/.